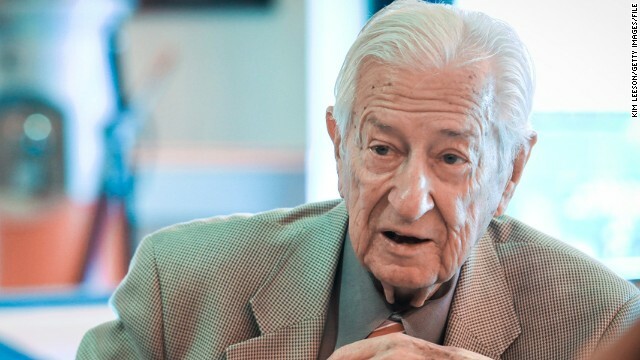 Washington (CNN) – Ninety-one-year-old Ralph Hall may have lost his primary on Tuesday - the first incumbent defeated this year - but the Texas Republican was greeted with a standing ovation by his House GOP colleagues Thursday morning and cracked jokes about his political future. A smiling Hall, who lost to tea party-backed candidate John Ratcliffe, told reporters after a closed-door meeting: "I figured it out – damn guy got more votes than I did!" Asked about his plans now that his more than three-decade career in Congress is coming to an end, Hall said, "I went to the employment office this morning and they didn't offer me anything, but I got a job here until December 31st." "At 91-years-old a contract for six months – you can't beat it," he added, referring to the rest of his term in the House. Hall, the oldest sitting member of Congress, said he talked about his age at the weekly meeting with his GOP colleagues. "I told them I was leaving because I heard Howard Coble was leaving and that would really make me the oldest guy," he said. North Carolina GOP Rep. Coble, who announced last fall he wouldn't run for another term, is 82 - almost a decade younger than Hall. On his election loss, Hall then admitted: "I was disappointed, I was just outspent." "I've heard money isn't everything but it sure keeps you in touch with your kids," Hall said, adding, "and by God it keeps you in touch with voters, too. And this guy had plenty of money, and he wasn't a bad candidate." You're too old. Kick rocks and enjoy your tax payer funded pension for the rest of your short time here on Earth. I like his sense of humor, but it really is time to move on and enjoy life. You've served long enough. Thanks and have a great rest of your life. May you live to 120! "who lost to tea party-backed candidate"
As a liberal I want more primary Tea Party wins! We have seen a few good examples of TP knocking out a moderate only to be defeated by the Dem moderate. TP is like the GOP's crazy uncle that keeps showing up uninvited. Go TP! The final sentence of this article is what got me. Regardless of their party affiliations, Reps. Dingell and Hall are owed a tremendous amount of gratitude for their sacrifices to our nation. A sobering chapter of our history is coming to an end. do you say this to and denigrate all the union workers that get taxpayer funded pensions? i doubt it. and what do you have against the guy anyways? at least he's been working and paying taxes, not mooching like so many people in this country. Enjoy the rest of your life sir, you've earned it. @Dutch/Bad Newz – Really? He may be bit older than you but he's got a better disposition and a much better outlook on life. To be 91, and still be among the living is a feat in itself. Why would anyone want to work a day longer? He should have waited for a poll defeat. It could have been more dignifying to retire when ovation was loudest. However in Texas, anything goes.